The life and secrets of managing a hotel by Ian Gardiner, General Manager at Saint George Palace, makes fascinating reading. He discusses his life in Bansko and offers up some tips for visitors and locals alike. It is a pleasure for me to share our conversation. 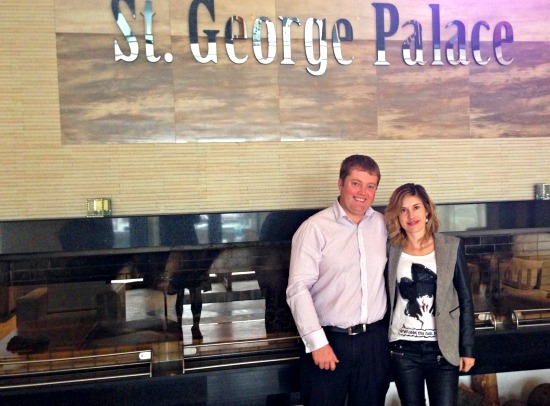 Tell me a little about you and how you ended up at Saint George Palace? I have a degree in Archaeology and Anthropology from Cambridge and, instead of going to Sandhurst, I jumped on a plane to Bulgaria to see how I could get involved in the overseas property boom that was just starting back in 2005. I had always been fascinated by Eastern Europe and the former USSR – especially having had a Russian stepmother for a few years. Combining this with the hype that Bulgaria was getting, it seemed that Bulgaria was the logical place to go. Having started off dealing with the normal real estate sharks, that were lurking in those days, I soon found myself buying and renovating village houses within “striking” distance of the beaches and golf courses north of Varna. Successful would be an exaggeration because in reality 95% of overseas buyers were investors, not second home buyers at this time. But it did give me experience in building and led me into dealing with both individual and corporate investors and a long term association with Rex Consulting, of whom I am still a consultant. One of the major clients we were engaged with were the original investors in the Saint George Palace complex and, to cut a long story short, we organised a takeout of the developer. So along with my wife, who is an experienced hotel manager, we took on the commercial operations of the building, and moved in. Tell me about a day in your life during the ski season? Needless to say, an early start is followed by quick report gathering of what has happened overnight and any queries for the day ahead. This is followed by the 7.30 school run. Maria, our eldest daughter, has started school next to the church in the centre of town, while Steffi is still in kindergarten. By the time I get back, breakfast is in full flow and it is all about getting guests onto the ski slopes as quickly, and efficiently, as possible. By 10am things have quietened down and I am able to catch up on the correspondence with apartment owners and our booking agents. We are an aparthotel which means that, other than the 400 guests in peak season, we have 150 apartment owners that I am responsible to as well as guests. Lunch is the only civilised meal of the day and I have made a resolution for this year to also use this time to disappear up onto the slopes. To my eternal shame we didn’t ski once during our first season! Mid afternoon sees the return of our guests from the slopes, so it is all about getting BBQs and mulled wine and whatever else going to help revive the exhausted sporty types. Typically, we would host an event in the evening. It could be a free wine tasting in the foyer by the roaring fireplace, which I will willingly join in with. After a final check on the bars and restaurant, I will hit the pillow while those with more stamina are still going strong downstairs. What are the most common top 3 questions asked by your guests on arrival at your hotel? Please give me one more? Where can I get a drink? – especially when travelling with children it works out to be a long day to get to Bansko. Do you have map of the ski runs and town that we can understand? – obviously the answer is yes, thanks to Bansko Blog Map! Where is the best place to buy food? – see my tip below. + 1 Is it safe to go walking in the forest with all the bears and wolves? – we are yet to lose any guests to the wolves, but guests are genuinely weary of disappearing by themselves. What are three hard-to-spot pitfalls that are critical when looking to run a successful hotel in Bansko? The most difficult balance to contend with is the changing demographics and nationalities that come to visit Bansko. While it is foolish to try and attract everyone to come and stay in one complex, if you rely on a very specific group, you will end up with an empty hotel at certain times of the year. My advice is to pick your demographic. We focus on the family market and on the active 30-50 year olds. We then adapt the service depending on the nationalities that come at different times of the year. If we were just British visitor centric we would be half empty at New Year and January. Outside of the ski season there wouldn’t be a soul in the hotel. The skill is working out what the Russians are expecting when they visit over New Year and Russian Christmas, what the Greek weekenders want in March and what the British will appreciate in February. The same thinking goes for our other guests from Romania, Turkey, Macedonia, Serbia and elsewhere. Get that right and you have a full hotel, with happy guests, for the whole ski season. The final critical balance is working out when to work within Bulgarian bureaucracy to the letter and when to let common sense rule the roost. Get that wrong and things go downhill very quickly! Looking out 3 to 5 years what do you think will be the next big change in Bansko’s tourism industry? It has to be the integration of all parties who have an interest in tourism in Bansko. The western European, and even more so north American mountain resorts, have managed to get everyone working together somehow. If the people running the lifts, the people running the hotels/restaurant, the local authorities and the national tourism agency don’t work effectively together then you don’t develop a great resort to visit. You just have a town with some ski lifts and runs above it. Last ski season the ski lifts closed the day after 50cm of powder fell on the slopes – I don’t blame the lift company as they foot the bill for running the lifts, but the fact that it happened shows how unlinked up everyone is. It is also about time that the municipality starts thinking big; rather than coming up with little initiatives. Regular visitors will have seen that the whole of centre of Bansko has now got paid street parking. This is fine, but the issue is that there is no alternative to either driving or taxis. Why not make more of the centre pedestrianised? Increase the cost of parking in the centre, but introduce out of town parking and a whole of host of free buses weaving around the resort paid for by the parking fees generated? Finally, the other big thing that needs to change is that, somehow, the word needs to get out that Bansko is a great place to visit in the summer. In the region, namely Bulgaria and the neighbouring countries, Bansko has already established itself as a great weekend getaway, but there is so much more to summer in this part of Bulgaria than a gentle stroll, a nice meal out and sitting by the pool; which is how 90% of summer visitors entertain themselves. What tips can you recommend to a Bansko visitor that you’d only share with a close friend (and everyone reading Bansko Blog)? Think really carefully before coming skiing in Bansko over New Year, you will be paying double for your accommodation. You have to plan well ahead to get a table in a good restaurant and be ultra disciplined to get up early and be at the gondola for 8am to avoid the inevitable queues. In short, if you can avoid New Year, please do so. If you can’t avoid New Year, plan well ahead, be disciplined and just accept things are more expensive while joining in with the party! When skiing in March – start early, finish skiing in time for a late lunch but instead of staying on the mountain escape to Dobrinishte where you can feast out in one of the Mehana “beer gardens” soaking up the sun followed by a dip in the hot mineral pool at Alpha where it is compulsory to have a cold beer while watching the sun go down. Self catering only works out cheaper in Bansko if you are really disciplined and head to Lidl in Razlog before you arrive – book something including breakfast and then eat out in accordance with your budget. When you don’t want to eat out, order in. It breaks my heart seeing people carry home frozen pizzas from the supermarket knowing that they are more expensive than the great takeaway pizzas that we, Victoria and others offer. What are three things you’ve told yourself that kept you going during your darkest hour? The sun will come up again tomorrow morning! I am lucky that I refuse to worry about things that are out of my control, which is essential in somewhere like Bansko. We have also been lucky to have, on the whole, very reasonable guests who don’t blame us when they have been queuing for two hours for the lift on New Year’s day. Having said that, I am well aware that if I was having a bad holiday, no matter who was to blame, then I would want to complain to somebody and am happy to be that person if it helps. I learnt from a young age that simply agreeing with someone when they are angry is the best way to diffuse the situation — as they just run out of steam. The more emotional guests tend to scream and shout and then act as your best friend ten minutes later. So I never take anything personally. If things are going well, don’t get carried away. But, equally, when things go wrong they will get better. Thank you Ian.It was a pleasure talking. - the season pass price- at 750 euros it is a joke. This is the same price as some season ski passes for mega ski zones in Austria with hundreds and even thousands of kilometers of ski slopes. Change that, Ulen. Now. I know that this ridiculous price protects your own ski school from proper competition (as external instructors have to pay the season ski pass and hence they have a huge additional cost to factor in) but this is simply ridiculous and unfair. - start treating your customers properly ,Ulen, Just look at the conversations on Bansko’s Facebook fan page. There are some great suggestions and questions there but the idiotic Community/Social media manager in charge of Bansko’s Facebook presence shows 1) total lack of respect and 2) often completely disregards relevant questions. This guy should be fired ASAP and Bansko should start caring about their clientele better. - Are Ulen blind about the comments they get in hugely popular sites such as Snow Forecast – https://www.snow-forecast.com/resorts/Bansko/6day/mid? No other resort in the world has so many polarized reviews. Read them all and start fixing things instead of pretending that they do not exist. - why are food and drinks on the mountain so expensive compared to town? In all alpine resorts the price difference in town and on the mountain is minimal, if any. - why is the car park next to the Gondola paid? As it stands it is 1/5 of the daily ski pass – this is huge. I have been to 4 French, 6 Austrian and 3 Italian resorts and I have never paid a single cent for parking next to the Gondola. They all had massive free car parks. Why, Ulen, why? - there have been so many suggestions to open the gondola a bit earlier in order to minimize the terrible queues at peak times. A 7:30 or 8:00 opening seems like a simple idea to implement, why has Ulen never done it? There may be some complications we do not know about and that make the whole idea unrealistic. Fine, but then at least communicate properly and let us know what these complications are. - why are Tzarna Mogila lift and run on the map? I have asked this question dozens of times on Bansko’s Facebook page but I never got an answer. I was banned from commenting instead!!!!!!!!!!!! Bansko Blog, I know that you are a business depending on Bansko doing well as a resort but in my opinion you should be a bit more critical towards Ulen and the Municipality. You are a well-respected media we skiers need your support to make Bansko a better place to ski. Only a real pressure from everyone (media, customers, business owners) can change things. On the long run this will be good for everyone. Thank you for taking the time to comment to the interview. It really is appreciated. At the moment I am rushed due to ski package order, App fixes, Map etc — so will come back and provide a longer response. Or better still ask other people to debate. I will only say for now on prices is that they are really good. Many ski resorts in the Alps have been in long term slight decline or minimal growth. Everyone has a choice on where to ski. Bansko, and other resorts in Bulgaria, have doubled their share of the ski market they had in just ten years. Popularity brings some issues, but typically if a particular time is busy then the law of demand and supply would suggest prices are too cheap… But believe me, your point on season pass is correct. That hurts me, I pay for everything, just like anyone else. For super cheap places to drink on the mountain download my guide and look out for alternative places. Having skied in Courcheval I can say prices there both on and off the mountain made me cry. Bansko is superb value in this respect. Any other views are welcome. But suggest the protests in Sofia right now are aimed at the root of some of the issues that sit behind a country struggling with legal reform and , quite simply, just getting stuff done. As for commenting on this kind of thing, I try to stick to stuff I know best… weather, snow, ski booking, apps, restaurants, technology. Once again, I appreciate your comments and keep them coming. UPDATE: Since reading your reply to my brief comment, I can see that you may not understand the commenting rules here. I will remove comments that are not polite and respecting to other people views. These are the house rules. Unsure still? Then go to Quora for their rules. I abide by the same rules. Rants, inconsiderate replies, accusatory style, trolls are all not acceptable or welcome. Be good to each other! Great item and interview with Ian and we love the Bansko App which is providing a wonderful service to visitors and businesses alike. Well done you. Thank you for your most kind comments, they are much appreciated. All reviews in Play / App store are super appreciated to help more downloads — help advertising. Thanks for getting back to me. Ok, fair enough. I understand your position. I always thought that media like yours should have a certain element of social commitment but I guess this is not the case. I have been to Courchevel//Trois Vallees – comparing that with Bansko is like comparing an Aston Martin with a Ford Fiesta. With 600km of slopes (in reality 500 km. Yep, over there they also cheat a bit) Les Trois Vallees can justify some inflated prices compared to the 70 km of slopes (in reality not more than 45-50 km) in Bansko. Bansko is indeed good value when it comes to accommodation and food/drinks in town. When it comes to ski pass prices (not just the season pass) and food on the mountain, however, I very strongly disagree with you – Bansko offers very poor value for money. The demand and supply theories you mention do not really apply in Bansko. These theories apply when people take rational decisions based on enough information (which often often lacks, otherwise you would not have the dozens if not hundreds of negative reviews for Bansko in snow-forecast.com). More importantly, these theories assume the existence of a perfect competition which has never existed on a number of levels in Bansko. Good read, Lance. Ian really seems to have his finger on the pulse of both his hotel and Bansko in general! Hi Philip, Thank you for reading and taking the time to comment. Yesterday the town was buzzing with pre season preparations. A lot of visitors, I may add that the hospitality industry is seriously hard work anywhere. Bansko is no exception. I’m seeing in more and more places a passion,like Ian’s, to provide their guests and visitors with a truly exceptional service. Ulen do seem to have an air of superiority about their actions which is a shame but all too common. Our business plus many others have requested time and time again for an open business forum at the end of each winter season over the last 3 years, allowing for feedback and constructive debate on how to better the infrastructure for the following winter season. We live in hope and will see if this winter will prove to be different, fingers crossed…………..
well DONE Valchev!! Great Job with BanskoBlog Lance!